This 9,000+ square foot project has beautiful lake views and plenty of real estate but is located almost entirely in the flood plain. The solution was to re-use fill from the front of the project in the back and raise the home as shown. A reflecting pool in the front of the home has been designed to draw guests in and then appears to flow into a natural spring in the back yard. One of the most amazing features of this home is the “man room”. It is a game room designed to display trophies and Texas memorabilia complete with wet bar, pool table, display cases, and covered balcony for cigar smoking, located away from the main house. Another amazing feature is the glassed hallway which connects the Main Living to the Master wing of the home, which gives you the experience of “walking on water”. The best views, though, are found in the glassed main living area. Complete with a Home Theater like no other, Fitness, Study, Game Room, and much more. This home is luxury living at its finest. 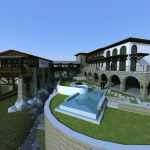 That is why this home was chosen, twice, for the Luxury Home Show! 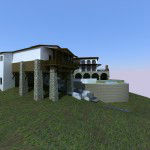 The architectural home designer on this project in Austin, Texas, was Jenkins Custom Homes. 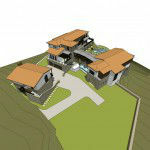 They employ in-house architecture with the latest technology for a state-of-the-art design and build experience. 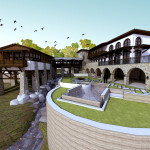 Using photo-realistic renderings produced entirely in-house with Revit Architect, the latest in CADtechnology, they walked the client through every room during design, before a wall was ever constructed.